For many consumers, the lack of electrical power or availability of natural gas or propane to their home dictates what type of tankless water heater they purchase. However, for many others, there is an option to install either an electric tankless water heater, or a gas tankless water heater. There is no simple answer to the question of which is better. The selection of an electric or gas tankless water heater should be determined after carefully weighing the pros and cons of each in conjunction with the individual homeowner's or business' needs and circumstances. When examining the economics of purchasing an electric or gas tankless water heater, the original cost of the heater and the cost of installation need to be considered. Purchasers often neglect to adequately consider the installation, which for gas tankless water heaters, can cost as much or more than the original heater. As far as initial cost is concerned, a good quality whole house electric tankless water heater generally cost about $500-700, whereas a typical gas tankless water heater cost about $1,000 to $1,200, especially for units with an electronic ignition (no pilot). Electric tankless water heaters are very high power appliances. Since a tankless water heater operates entirely on demand and must do the work of a traditional water heater in a few minutes rather than throughout a whole day, the peak electrical consumption of an electric tankless water heater is relatively high (of course, they consume a lot less power overall!). Accordingly, in cold climate areas or demanding applications (high flow rate), it may be necessary for the home or business to have a 200 AMP electrical service to run an electric tankless water heater. For less demand applications or in warmer climates, only a 100, 125, or 150 AMP electrical service is usually required. This is an important consideration since not all homes and businesses have such electrical power available and upgrades can often be expensive. Of course, installation of a gas tankless water heater would likely be grossly uneconomical if the building did not already have an existing natural gas or propane service. In many instances, the installation of a gas tankless water heater requires that the diameter of the incoming gas line be increased to handle the additional fuel requirements of a gas tankless water heater. This too can be very expensive. Furthermore, gas tankless water heaters have complex venting and combustion air supply requirements. It is rare that existing venting ducts can be used. When side wall venting is required, it can get even more complex. Due to their high gas consumption, existing fresh air ventilation systems are also rarely adequate. The bottom line, is that these requirements can make installation very expensive. While gas tankless water heaters are much smaller than a conventional tank, electric tankless heaters much smaller, only about one third the size. Due to their small size and the fact that they do not require ventilation, they can be often be installed much closer to the actual point of use and in many locations where it is not possible to install a gas unit. In most circumstances, the installation of an electric tankless water heater will be much more cost effective than the installation of a gas tankless water heater. For most homeowners and businesses, their water usage habits and patters will not impact their selection of either electric or gas tankless water heater. This is because most homes and light commercial applications require relatively modest water flow rates as they typically run most major applications on a back-to-back basis. A properly sized electric tankless water heater can provide up to about 3.0 to 3.5 gallons per minute in a colder climate, and up to 8.0 gallons per minute in a warm climate area. This is enough to suit the needs of most applications. Certain gas tankless water heaters are capable of supplying higher flow rates, but are often the most expensive to install due to their onerous venting, gas line, and combustion air requirements. The ongoing cost of operating your new tankless water heater is obviously an important consideration. However, it is not as simple as comparing the cost of operating an electric and gas tankless water heater based on today's energy prices. At present, a natural gas tankless water heater is about 10-15% cheaper to operate than an electric tankless heater. A tankless electric heater is generally cheaper than a propane tankless heater. It is important to keep in mind that electric tankless water heaters are generally 99%+ thermal efficient, whereas the efficiency rating of most gas tankless heaters, even the better quality units, range from about 80 to 85%. 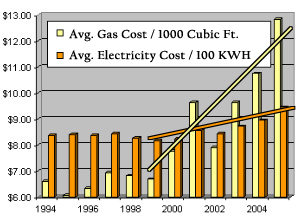 Even though natural gas is generally a cheaper fuel than electricity per BTU of heating power, the higher efficiency, longer service life, and cheaper installation of an electric tankless water heater can easily outweigh the small current operating cost difference which would amount to only a few dollars per month for most families. Since tankless water heaters can easily last more than 20 years, you have to consider the long-term cost of both electricity and natural gas as well. In fact, future rates will have a much more significant impact on the overall cost of heating hot water over the life of your tankless heater. According to the US Energy Information Administration, consumer electricity prices rose only 12.8% between 1994 and 2005, yet natural gas prices rose a whopping 114.5%. Most energy analysts project that natural gas demand will increase at a rate of 2 to 3 times faster than the addition of new supply, and that this imbalance will continue to cause rapid future increases in natural gas prices. Electricity prices are also forecast to increase, but at a much slower pace. Moreover, due to supply interruptions, seasonal demand, and foreign political issues (Middle East conflict for instance), gas prices tend to fluctuate more dramatically than electricity prices. The result can be huge increases in home utility bills in a short period of time, whereas electricity tends to remain more predictable and consistent. Within a few years, it is very likely that a tankless electric water heater will not only be less expensive to purchase and install, but it will also be cheaper to operate as compared to a gas tankless heater. Growing concerns over global warming due to greenhouse gas emissions are increasing our awareness of the burning of fossil fuels, like natural gas and propane, as an energy source. Accordingly, as consumers, we are being encouraged to reduce of greenhouse gas emissions for the benefit of future generations. While switching from a conventional water heater to any type of tankless system is a good environmental choice, in most regions, especially those that generate electricity from sources that do not increase green house gases (hydro-electric generators, nuclear, wind, etc. ), switching to a tankless electric heater is even a better choice. Also, since an electric tankless water heater is much smaller overall, especially when considering all of the venting materials and supplies required for a gas tankless heater, the eventual impact on landfill space decades down the road is not as significant. As well, less energy and resources are used to manufacture an electric tankless water heater. The maintenance of an electric tankless water heater is very straightforward, in fact, other than ensuring that the inlet screen filter that prevents large debris from entering the system is free and clear of obstructions, no maintenance is required. Gas tankless water heaters on the other hand, require annual inspection to ensure safe fuel combustion and operation. In the event of a malfunction, electric tankless water heaters tend to be much easier to troubleshoot, diagnose, and repair. Our company used to sell gas tankless water heaters, but with rising gas prices and increasing concerns about the burning of fossil fuels, we concluded that for most of our customers, electric powered units were a better choice. We now sell electric units exclusively. For most homeowners and businesses, the high costs of installation of gas tankless water heaters make electric units much more practical and cost effective, and a better overall investment. Of course, we realize that there are some situations were a gas tankless water heater may still be more appropriate. If you would like us to help evaluate your own particular situation, please call us toll free at 1-877-374-2696 and we will give you an honest assessment of whether an electric or gas tankless would be better for your needs. For most homeowner's and businesses, an electric tankless water heater is usually a far better choice than a gas tankless water heater. In addition to being cheaper to buy and much cheaper to install, advances in technology allow them to meet high flow rate demands in most climates, they last longer, have longer warranties, require less maintenance, and are better for the environment. 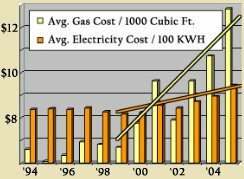 As you will see in the graph below, the price of natural gas has been rising at a much faster pace than the price of electricity. Economists expect that this trend will not only continue, but that it will accelerate. Accordingly, in just a few short years, it is very likely that electric units will become significantly cheaper to operate. When you consider the fact that a tankless water heater can easily last 20 to 30 years, future energy prices are far more important than comparing today's gas and electricity prices.